is bright and contemporary and it is wonderfully practical. Check the gauges, manage the air-conditioning, navigation lights, lighting, and hi-fi system from the driving console or a wi-fi connected tablet: a quick tap or slide of the cursor and the Gran Turismo 50 safely obeys your every command. 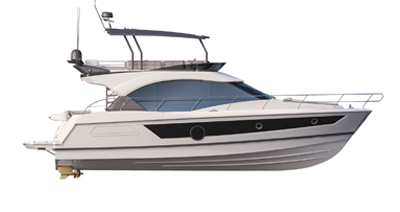 Elegant and smart from bow to stern, the Gran Turismo 50 is equipped with a Williams Minijet 280 compatible tender garage, that will hold any standard outboard tender up to 2.90 m. It opens onto a 1.40 m submersible swim platform, withstanding up to 350 kg. This hydraulics operated platform can also hold a various items of water sports equipment, which are easy to launch and hoist back on board. Overlooking the swim platform, you can add a grill and worktop to complement the pleasant outdoor galley located in the cockpit. The Sportfly sums up the uniquely generous yet sporty temperament of the Gran Turismo 50. With a two-seater co-pilot’s bench that converts to a sun-lounger and an aft saloon for five people, share a truly sensational cruise on the Sportfly. The Ship Control interface can be accessed from the navigation screen of the flybridge’s driving station. U-shaped flybridge lounge seating 6 people, sun-lounger, bimini. Second driving station overlooking the sea, seamlessly integrated in the boats lines. Duplication of the SHIP CONTROL on the navigation display. Tender garage to stow away 9’5” RIB tender with engine in place or a Williams minijet 280. Volvo IPS 600 engine combined with second generation Air Step®. Submersible swim platform where you can keep a jet ski. Small exterior galley: grill-worktop above the swim platform. Furniture storage. SHIP CONTROL on-board technology. 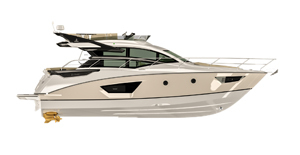 User-friendly and intuitive interface providing simple access to many of the boat’s functions. Full-space main deck: the cockpit continues towards a large protected lounge. Full-beam pocket sliding glass door. Very large forward sun lounger (43 sq. ft.) with lifting backrest. Huge "full-beam" owner cabin and VIP cabin with V-berths, sea view on either side and en suite shower room. Double guest cabin. Spacious, bright and fully fitted, L-shaped galley with Corian worktop and cabinets lacquered in Taupe. Large 190L fridge-freezer, ceramic hob, microwave oven/grill. Shower room opening onto owner suite, second shower room adjoining the guest cabin. Large light shaft in companionway, galley bathed in light. Lots of storage in the cabins. Owner suite: storage on either side of the bed, large locker below the bed and large portside hanging locker. Huge "full-beam" owner cabin and VIP cabin with V-berths, sea view on either side and en suite shower room. Second quieter, cosy lounge facing the galley. Lots of top storage space.